Sargassum decurrens. Photo: B. Baldock. Adelaide shores have recently been battered by high winds and waves, and we generally concentrate on the damage they cause to landscape and property. But storms may also wash in the unusual and unexpected. 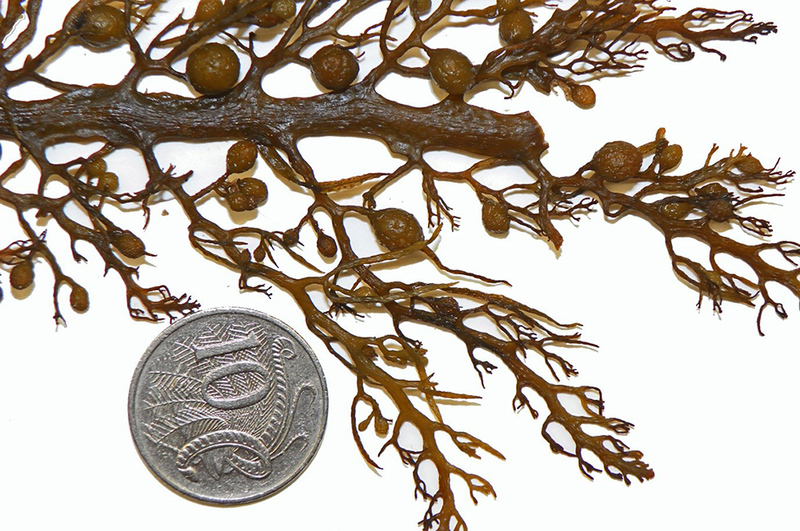 A volunteer from North Haven, who works in the State Herbarium of South Australia‘s Phycology Unit, brought in a brown alga, Sargassum decurrens (R.Br. ex Turner) C.Agardh, cast up by the rough weather. Sub-tropical, generally found in Western Australia, Northern Territory and Queensland, this species has only occasionally been found growing in northern Spencer Gulf of South Australia at depths of 6 to 10 m. It’s probably a relict from a time when local seas were warmer, got trapped in the larger of our gulfs when the climate changed and now survives precariously, together with several other sub-tropical species, in areas of high summer temperatures — other relict species include the brown alga Hormophysa triquetra (C.Agardh) Kützing and the red alga Asparagopsis taxiformis (Delile) Trevisan. How did it get to Adelaide? We have past records of drift plants at Port Stanvac and Marino, but no plants actually attached to rock, so wind and currents presumably have carried them west and north into Gulf St Vincent. Will climate change mean that in the future we might see this species growing on local rocky shores? Sargassum decurrens, close-up. Photo: B. Baldock. 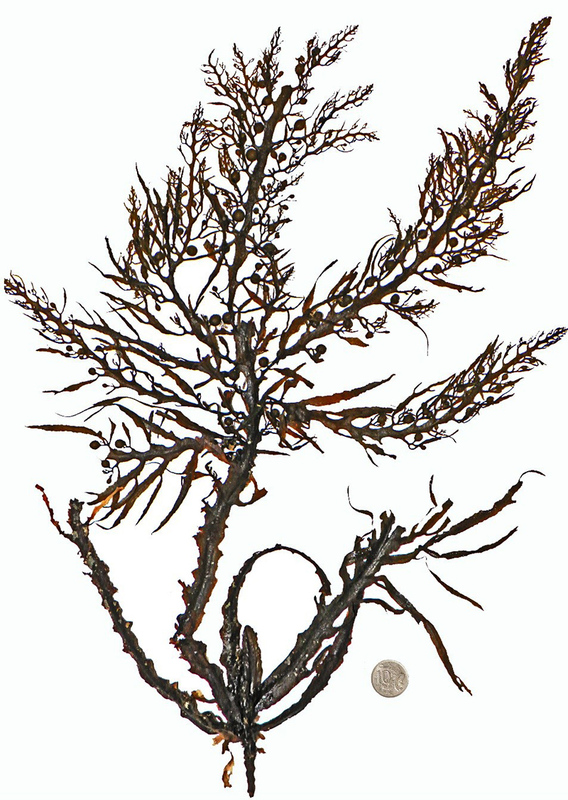 Sargassum decurrens is dark brown and tough, the main branches are strap-like with characteristic wings, flat-branched and end in thin, “leaves” and gas floats with fine, relatively long stalks. Our specimen is a particularly fine one and will be a welcome addition to the Herbarium’s collections. Contributed by Hon. Research Associate Bob Baldock. This entry was posted in The Plant Press on 26 July, 2016 by Jürgen.